A couple weeks ago my girl's preschool did 'Healthy You' week. I took this as an opportunity to introduce the other preschool moms to Living A Whole Life so I made a little flyer and took in some business cards. This immediately sparked conversation about how they could get their kids to eat better. In some ways I found it difficult to provide general information. Each child is different and each family is at a different level of nutritional awareness. Ever since, I have been thinking about what moms and dads can do to encourage healthy eating and what some of the roadblocks are that stop them from doing so. Give your children the gift of good nutrition. Teaching your kids to eat healthy now is one of the greatest gifts you can give them. It is right up there with love, self esteem, and a good education if you ask me. As some of you already know, this is not an easy gift to give. It takes some extra time and effort to both shop for and prepare healthy foods (mostly because it is not a habit for us either) and to get your kids to eat them. So the next time your kids are begging for sugar cereal at the grocery store, be strong and remember that the gift you give them today will last a lifetime. Start talking today. Whether your child is 2 or 12, it is important to start talking to them about good nutrition today. 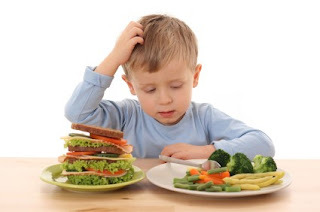 Yes, I know old habits are hard to break, but if you engage your child in the converation about why eating healthy foods is important they may be more willing to try a few new things. For example, I have always made a big deal about growing up strong and smart with my girls who just turned 5. At a very young age we made jokes about how treats or chips go to our butts, but good foods like fruits and veggies go to our brain, our muscles and our bones. They still ask me where certain foods go and giggle in anticipation of the answer. Older kids may relate to getting better grades or getting better at their favorite sport. Model the behavior. Monkey see, monkey do when it comes to smaller children. Changing your child's mind will not happen with words alone. You must personally jump on board by, as Ghandi says, "being the change that you want to see in the world." For instance, sorry in advance J, but Karla and I have a brother-in-law who is a really picky eater. He turns his nose up at tons of different kinds of foods without thinking of how that looks to his children. Today at 10 and nearly 8, they too are extremely picky eaters. Hmmm. Now I will let you in on a little secret (glad my kids can't read too well yet)...I don't like raw tomatoes. I love them cooked, but still with as many times as I have tried them, I just don't like 'em raw. The key here is, my kids have no idea that I don't like them. I have never spoken the words or made a big deal of it at all. They love raw tomatoes and want to eat them off my salad all the time. What a nice mom I am, I let them have my tomatoes every time! Make gradual changes (sneaky if you have to). You can't expect your kids to react well to a complete eating overhaul all at once. You wouldn't like it if someone did that to you, so make changes slowly. A couple good places to start: if you are a white bread family, make sandwiches with one piece of white and one piece of whole wheat bread and eventually change it all over to whole wheat. Or, if your kids eat peanut butter and jelly a couple times a week like mine do, mix equal parts regular peanut butter with natural peanut or almond butter. Get them used to the no sugar nut butter and eventually switch completely. I am actually in the process of changing the peanut butter right now. I'll let you know how it goes over. Encourage your kids to try new things. Now this can be a toughy for a lot of adults let alone kids. I am a firm believer though that if you don't try it you won't know if you like it. When the girls were really little, like 2 1/2 or so, we would make salmon and call it salmon-chicken. They knew they liked chicken so they tried it. We have since dropped the chicken, they know it is fish and it is family favorite. Side note: I wasn't a big fan of salmon because my mom often made salmon patties which smelled really bad to me growing up. My husband got me to try the real thing and I love it! Tip: Try the 'no thank you bite' rule. Put the new food on your child's plate and if they refuse to eat it ask them to take at least one bite and then they can say 'no thank you' to the rest. This encourages an open mind without the pressure of having to eat it all and who knows they may like something. Don't make dinner a battleground. I know it is frustrating when kids don't like what you made or won't eat what you think is a decent amount of food, but try to stop yourself from letting mealtime turn into wartime. Let your child know that this is what is for dinner and that you hope they will at least try it. I would encourage you to introduce new things a little at a time and always make sure there is at least one item on your child's plate that you know they will eat. Do not bribe them to eat in order to get a treat afterward. This sets a bad precident. And, once dinner is done (no more than a 1/2 hour) just remove their plate from the table and call it good. A fight over food every night will do nothing but escalate a battle of wills and associate bad feelings with dinnertime for everyone. There is no clean plate club at our house either. I want my children to rely on their bodies to tell them when they are full, not me. On the other hand, I have one little wild girl who needs some encouragement to eat so she usually gets stuck having to take 2 or 3 more bites of certain things before she is officially done. I think she just plans for it now. She often asks if she needs to take 1, 2 or 3 more bites of something. FYI, the answer is always 3. Children's nutrition is so important today especially with the epedimic of diabetes. I am so glad this post is out there for people to see. I just wanted to let everyone know that All Sport Natural Zero will be available in April 2009. This drink is sweetened with stevia instead of sugar and is all natural with zero calories. It is a mom's dream come true! It has essential vitamins and low sodium. It comes in a variety of flavors that kids are going to love. I think kids are going to LOVE this because it tastes great and moms will love it because it is a healthy option for their children.